Video clip synopsis – James Scullin inspired the people when he offered to rent out The Lodge during the Depression, but his fierce nationalism is best revealed in his campaign to install an Australian-born Governor General. Broadband MP4 scullin_bb.mp4 (18.6MB), suitable for iPods and computer downloads. 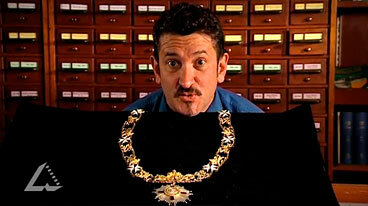 James Scullin And The GCMG is an episode from the series The Prime Ministers’ National Treasures, produced in 2007. He was elected to Commonwealth Parliament in 1910, lost his seat in 1913, and was re-elected in 1923. He became Australian Labor Party leader in 1928. Labor won the 1929 election and Scullin became Prime Minister — the first Catholic to do so. Unfortunately, this was also the start of the Depression. One week after Scullin’s electoral victory, the Wall Street stock market crashed, and investors raced to withdraw their investments. Australia depended on foreign loans to support much of its economic activity, so the loss of loan money, together with the need to repay existing debts, and falls in the price of our major agricultural exports, led to huge unemployment as employers had to cut back on their activities. The new Prime Minister, James Scullin, refused to take up residence in The Lodge. Instead, he offered to rent it out to defray the costs of the Prime Ministership—an act which would be unthinkable today. Scullin had backbone, and even when his mission to appoint an Australian-born Governor-General met with furious opposition from the British Government and Australian public disapproval, he insisted on forwarding the name of only one candidate—Sir Isaac Isaacs. King George V was not amused, but the precedent had been set—in effect the Governor-General was being appointed not by the King but by the Prime Minister— and Isaacs was anointed to the Order of St Michael and St George as Knight Grand Cross (GCMG) and presented with the insignia chain. James Scullin (1876 -1953) was Prime Minister of Australia from October 1929 to January 1932. The GCMG is held at the National Library of Australia in Canberra. During the 1930s Australia was hit by The Depression. What impact did the Depression have on the country and the people? Ask a range of people what “The Depression” means. Historian David Potts has recently argued that the ‘myth’ of The Depression — the popular image of terrible suffering that you have probably discovered in your own survey — is not true. It was true for some people for some of the time, but is very much a minority experience. If Potts is correct, how was The Depression experienced by Australians. Research this topic looking specifically at whether differences in Australians — whether they lived in cities or the country, whether they were men or women, young or old, working or unemployed, single or family, with support or without, skilled or unskilled — made any difference to The Depression experience.